Some of the best paintings of the Masters are those of intimate family moments, such as Rubens’ Two Sleeping Children (c 1612-13). 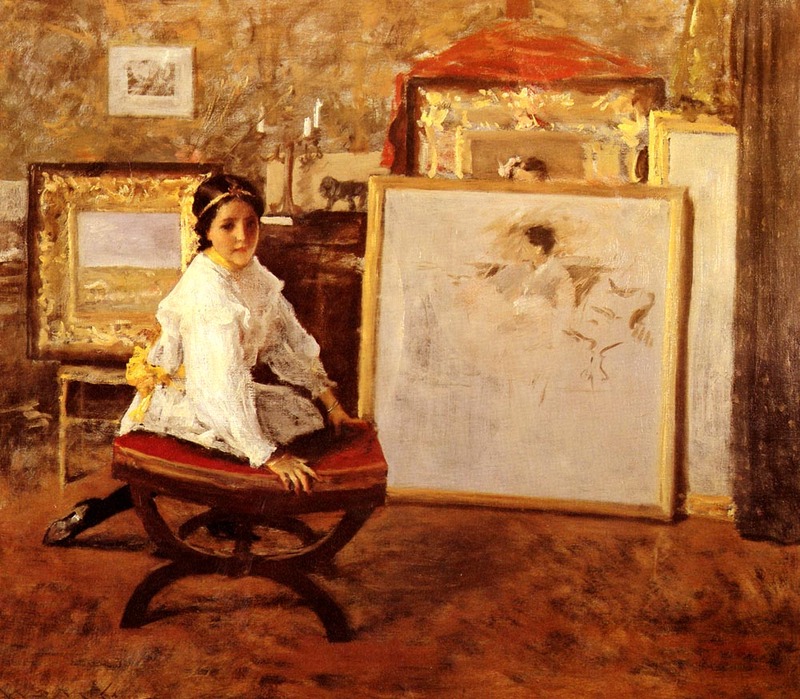 William Merritt Chase (1849–1916) made many informal sketches of his family and other children, which are among his most candid and insightful works – and the subject of this article. 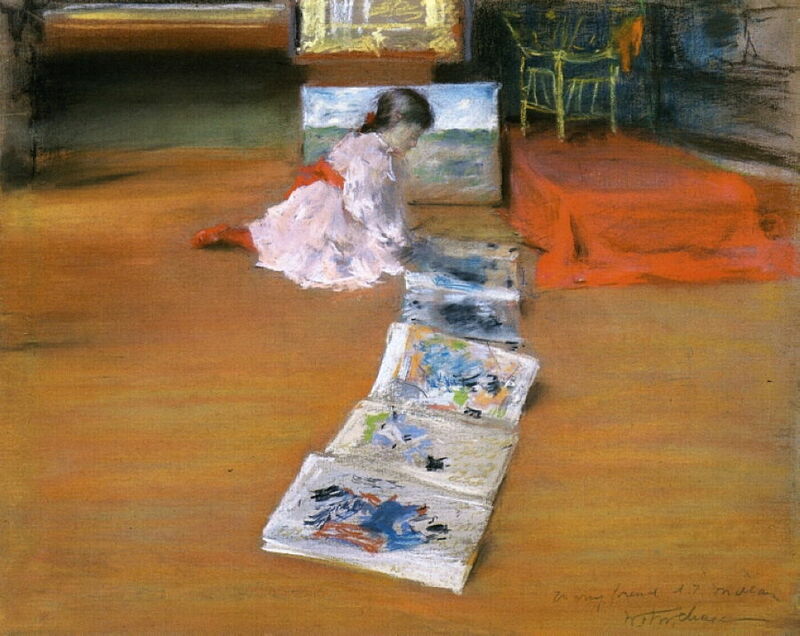 William Merritt Chase (1849–1916), Child with Prints (c 1880-1884), pastel on canvas laid down on board, 55.9 x 44.5 cm, Private collection. The Athenaeum. Long before he had his own, Chase demonstrated his skill in depicting young children in his wonderful pastel Child with Prints (c 1880-1884). Caught rummaging through a folder of prints in his Tenth Street Studio is the young child of a friend or model: the sort of amusing incident that happens to many of us. The toddler’s studious face, as they sit holding papers in front of them, immediately dispels any upset at the chaos that surrounds them. 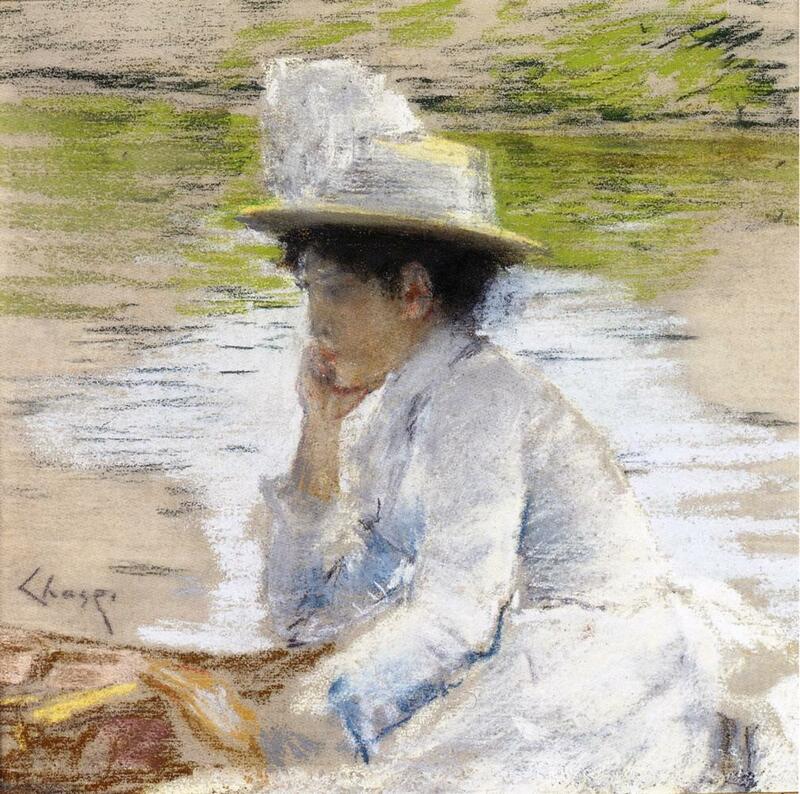 William Merritt Chase (1849–1916), Portrait of Mrs. Chase (c 1886), pastel on paper, 26 x 26.7 cm, Private collection. The Athenaeum. Chase first met his wife, Alice Bremond Gerson (1866-1927), in 1879 when she was only thirteen, and still known as Posey. He married her on 8 February 1886, although some sources claim it was 1887, when she was nineteen and he was thirty-six. His very loose Portrait of Mrs. Chase (c 1886) is an early sketch which probably dates from their first summer together. Initially, the couple lived with William’s parents in Brooklyn before moving to their own place in Greenwich Village. 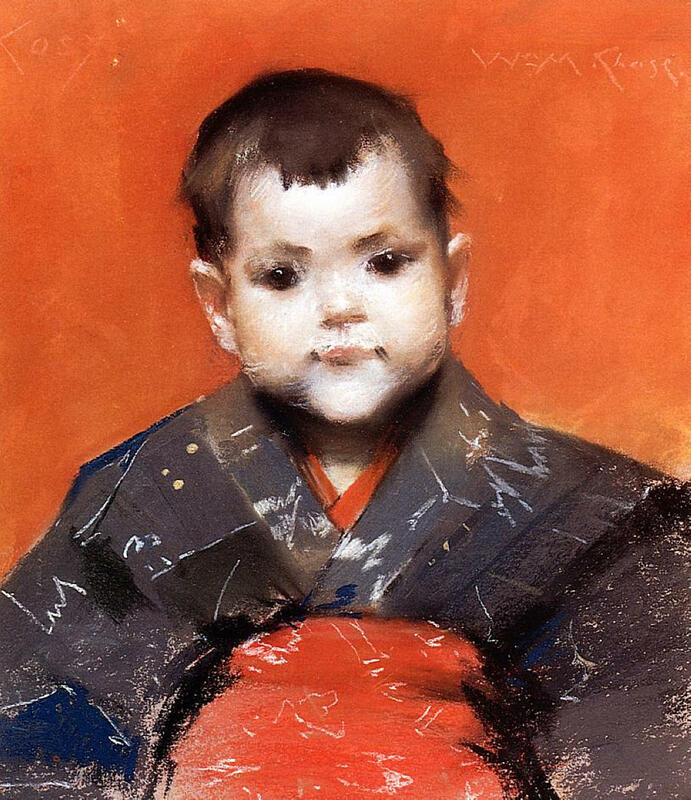 William Merritt Chase (1849–1916), My Baby Cosy (1888), pastel on board, 35.6 x 30.5 cm, Private collection. Wikimedia Commons. Chase’s pastel My Baby Cosy (1888) expresses the particular joy that every parent feels in their first baby, reflected in Alice’s second name of Dieudonnée (‘given by God’), when she was just a year old. She wears a kimono-like gown, which makes her appear quite Japanese. 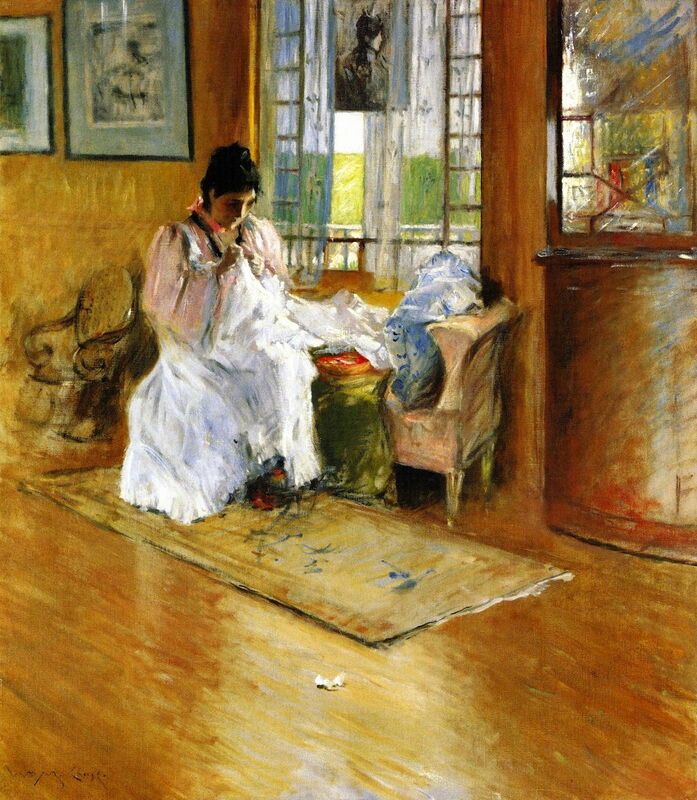 William Merritt Chase (1849–1916), Hide and Seek (1888), oil on canvas, 70.2 x 91.1 cm, The Phillips Collection, Washington, DC. Wikimedia Commons. 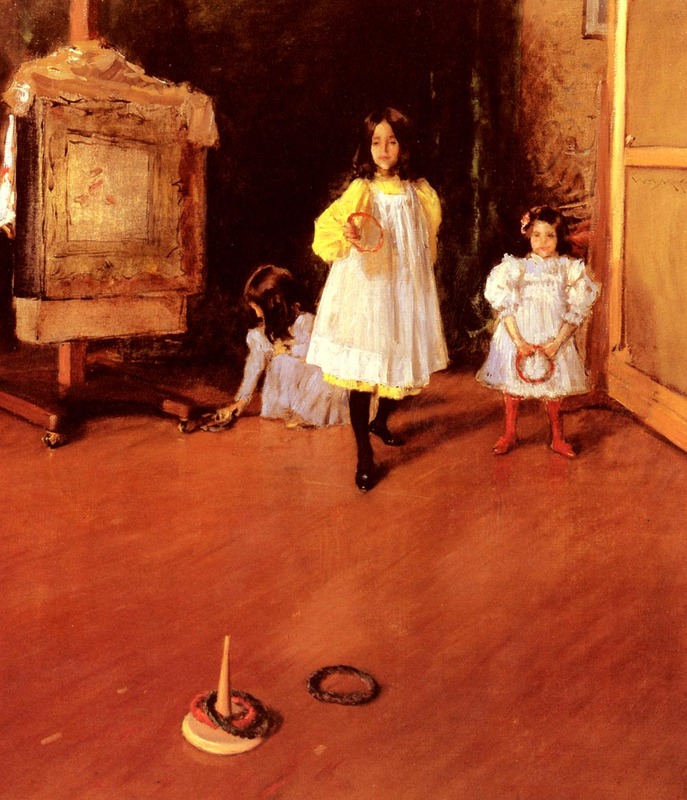 Hide and Seek (1888) does not show the Chase children (Alice was but a year old at the time, and the older girls were dark-haired too), but two visitors. It is both a familiar representation of a childhood game, in which the seeker has crept up behind the girl in the distance whose attempt to hide has failed, and one of his most unusual studies in space and its representation. Its stark, sparse, and almost flat image with simple geometry – reminiscent of Whistler’s work – only gains depth through the echoed figures of the girls, in similar postures, their backs turned and looking into the picture. William Merritt Chase (1849–1916), Children Playing Parlor Croquet (c 1888), oil on canvas, dimensions not known, Private collection. The Athenaeum. 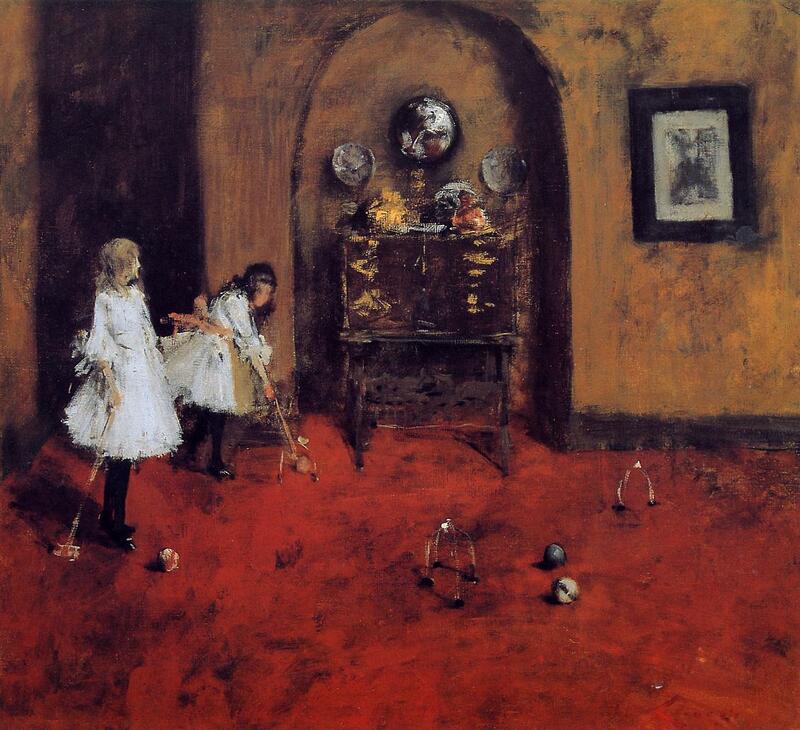 Children Playing Parlor Croquet (c 1888) must also show the daughters of others, if it is correctly dated, as they take over a room to play the indoor version of this game, which was popular at the time. Alice the mother and Alice the daughter are the subjects of his fine pastel I’m Going to See Grandma (Mrs. Chase and Child), dated to about 1889 when the girl was just two years old, and being dressed in her best for the visit. In 1892, Chase, his wife and three daughters found fresh freedom when they moved into their new summer home in Shinnecock, Long Island. Away from the seemingly endless buildings and streets of New York City, just a few steps outside their front door they were surrounded by countryside. Unlike in the city, Chase’s studio was here integrated into the family home, and the children seem to have enjoyed frequent and unlimited access to it. Many of Chase’s most candid paintings were made here in Shinnecock. 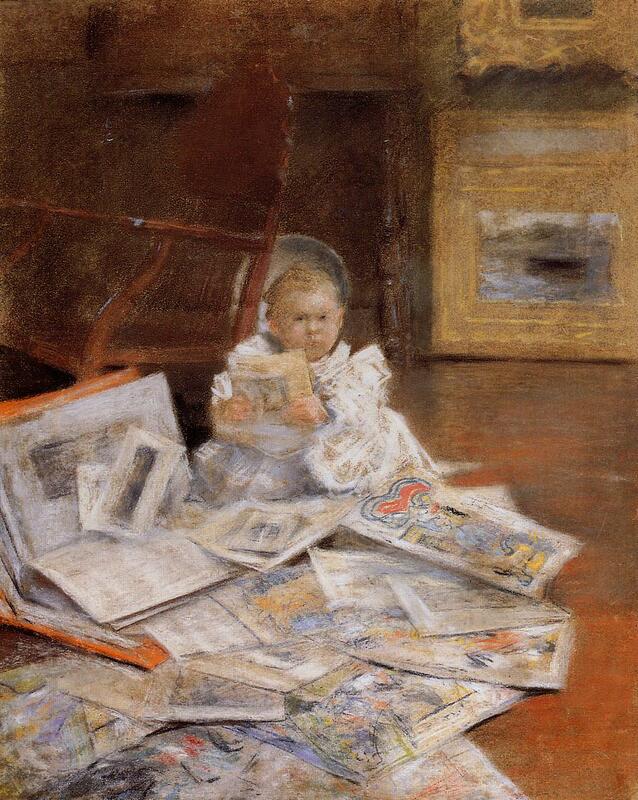 His pastel Shinnecock Studio Interior (1892) shows one of the girls looking through pictures, perhaps a reminder of his earlier Child with Prints (above). 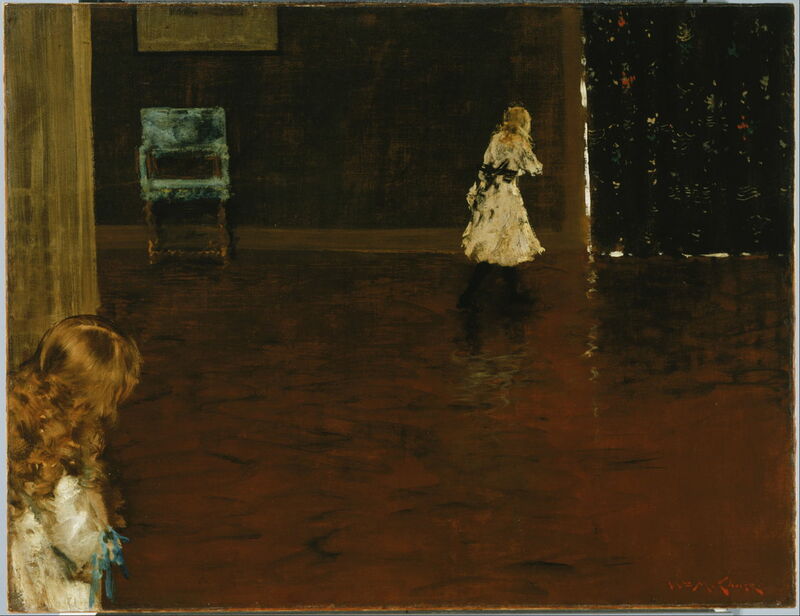 William Merritt Chase (1849–1916), Hall At Shinnecock (1892), pastel on canvas, 81.6 x 104.1 cm, Terra Foundation for American Art, Chicago, IL. Wikimedia Commons. Those pictures have moved out into the Hall At Shinnecock (1892), another fine pastel, this time showing his wife, Alice and Koto, in the rich summer light. 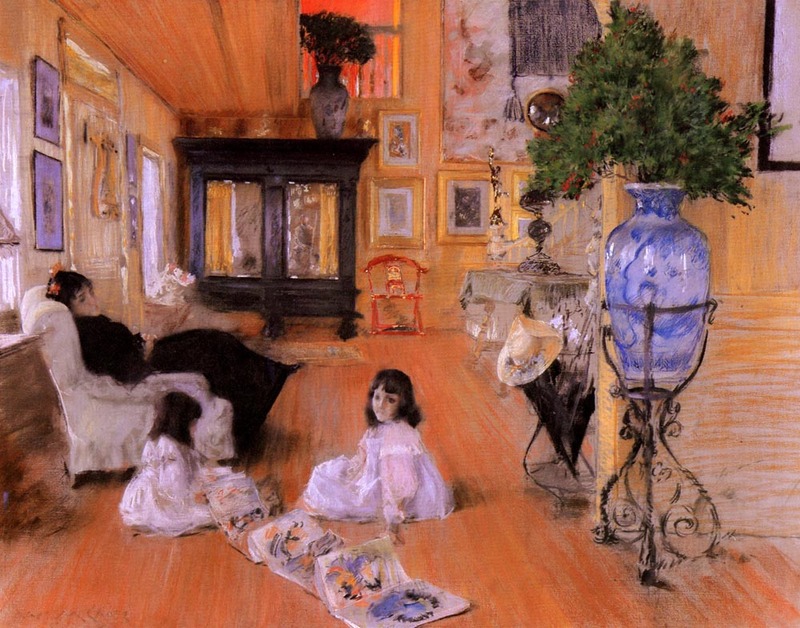 William Merritt Chase (1849–1916), For the Little One (Hall at Shinnecock) (c 1896), oil on canvas, 101.6 x 89.5 cm, The Metropolitan Museum of Art, New York, NY. The Athenaeum. Caring for their growing family must have kept Mrs Chase hard at work for most of her waking hours. By the time that she is seen sewing in For the Little One (also sometimes confusingly known as Hall at Shinnecock) in about 1896, they had four daughters ranging from three to nine years of age. While mother was busy making and mending, and caring for little Hazel, the older girls might play with father. The Ring Toss (c 1896) shows those older girls – Alice in yellow, with Koto and Dorothy – playing most probably in the Shinnecock studio. 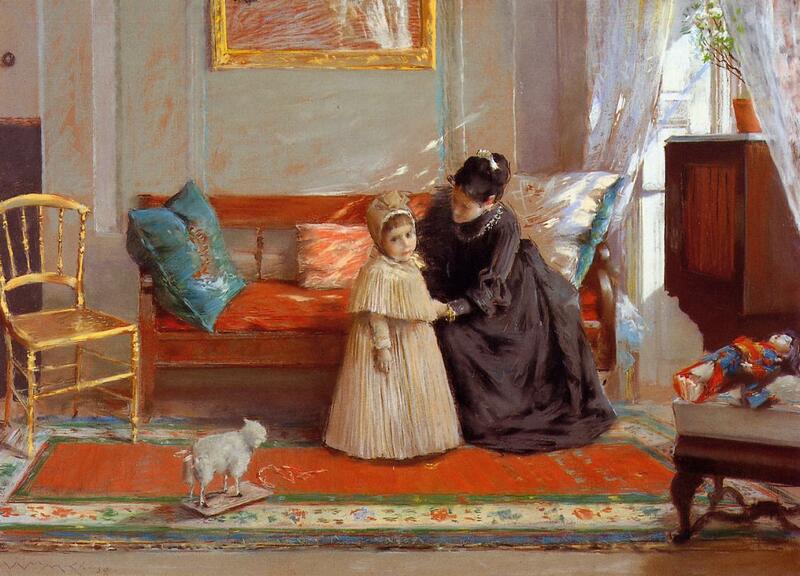 William Merritt Chase (1849–1916), Did You Speak to Me? (c 1897), oil on canvas, 96.5 × 109.2 cm, Butler Institute of American Art, Youngstown, OH. Wikimedia Commons. Did You Speak to Me? (c 1897) shows Alice, then aged ten, in the studio at Shinnecock, perhaps while she was waiting for her father. 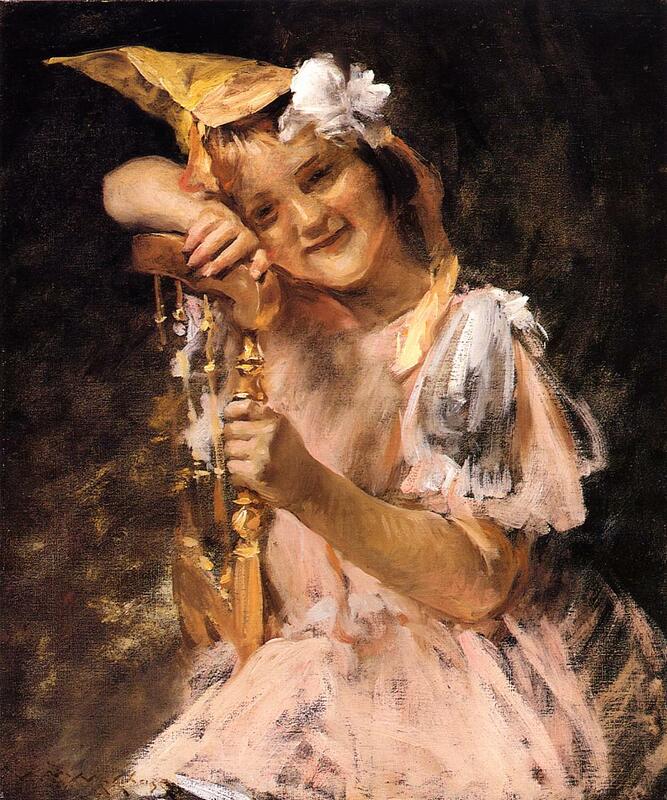 In my previous use of Chase’s Alice in the Shinnecock Studio (c 1900), I had presumed that his painting showed his wife Alice, when it is almost certain that it shows daughter Alice, at the age of thirteen. By this time, his wife’s support to their six or seven children severely limited her availability as a model, and Chase was only too happy to use his oldest daughter instead. But Chase was still not done with superb celebrations of childhood: with several young children in the family, and Mary Content still to come, The Birthday Party (Helen Velasquez Chase) (c 1902) captures what it is like to become five. Having seen Chase’s family in their normal life, and at play, I will next select some of the many portraits which he painted of them. Hello, Do you know which one of the children was nicknamed “Rolie”? in his wife’s sister Virginia Gerson’s childrens book “The Happy Heart Family” there is a dedication to a “Rolie”? I would have thought the most likely was Roland Dana, about whom I have been able to discover nothing, not even the year of his birth! 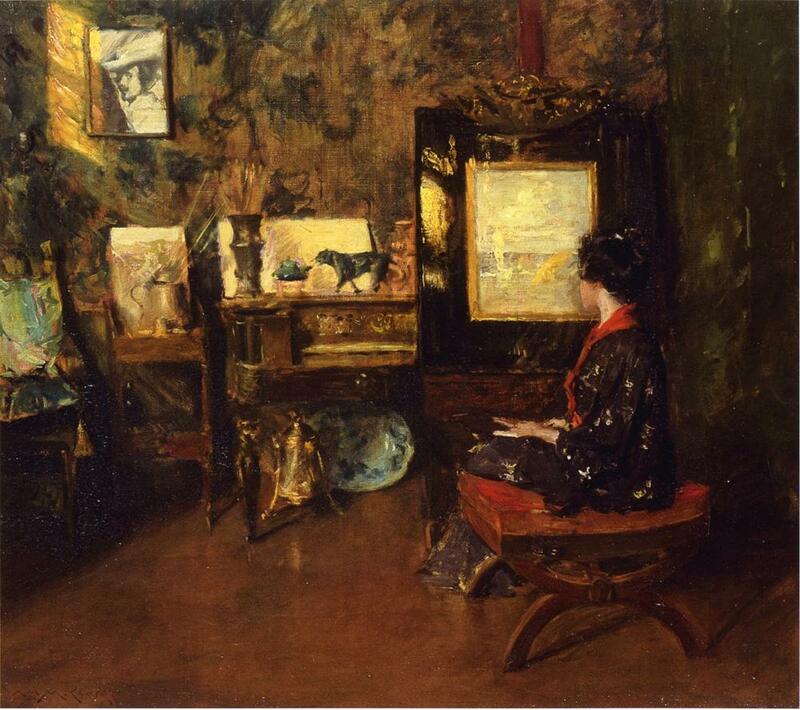 Hi, I’m William Merritt Chase’s greatgrandaughter and I’m looking to find info on my remaining two oils: one by daughter Koto( flowers in brass bowl) , and a largemasterpiece by his student Frank Wadsworth, Of a front door scene. Can anyone help? I’m delighted to meet you here, and hope that you have enjoyed looking at a few of his works in these articles. I don’t know anyone who is a scholar on the works of his children or students. Normally I suggest that you contact your nearest major gallery, as they will have a scholar who may well be able to put you in touch with a specialist in the field. Have you tried that yet?